Conrad Fondrk of the '06 Bakken Oilers goes between-the-legs for a goal in Sunday's 4-0 championship win over Euro American Blue. 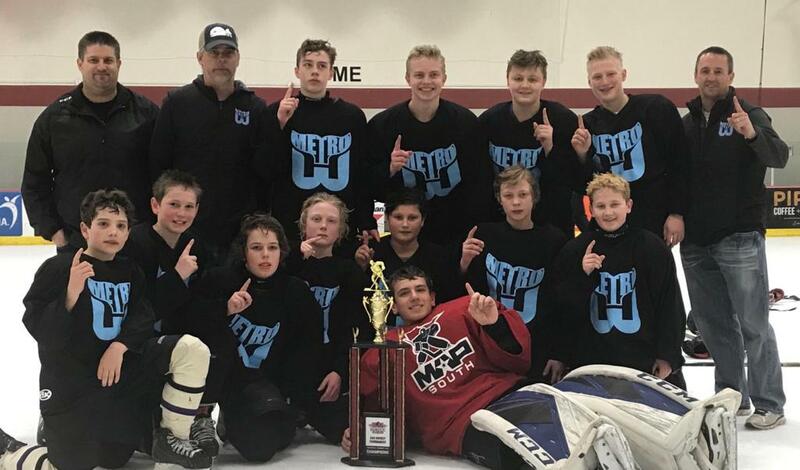 YHH caught five of 11 Ignite the Ice championship games on Sunday, with three titles captured in Edina and a pair in Prior Lake. The Minnesota Grey Ducks took home the crown in the 2010 Red Division following a close 7-6 win over Tommy Chicago Green. The Grey Ducks took a 3-1 lead early in the second period, and alternated between two-goal leads and one-goal leads for the remainder of the game. The Grey Ducks took a penalty with just 1:22 left in regulation, and withstood a late charge by TC Green while killing off a penalty and dealing with an extra attacker due to a pulled TC Green goaltender. Jack Goter and Brooks Suter each scored two goals in the win for the Grey Ducks, with single goals coming from Henry Sigstad, J.J. Bauer, and Miller Basgen. 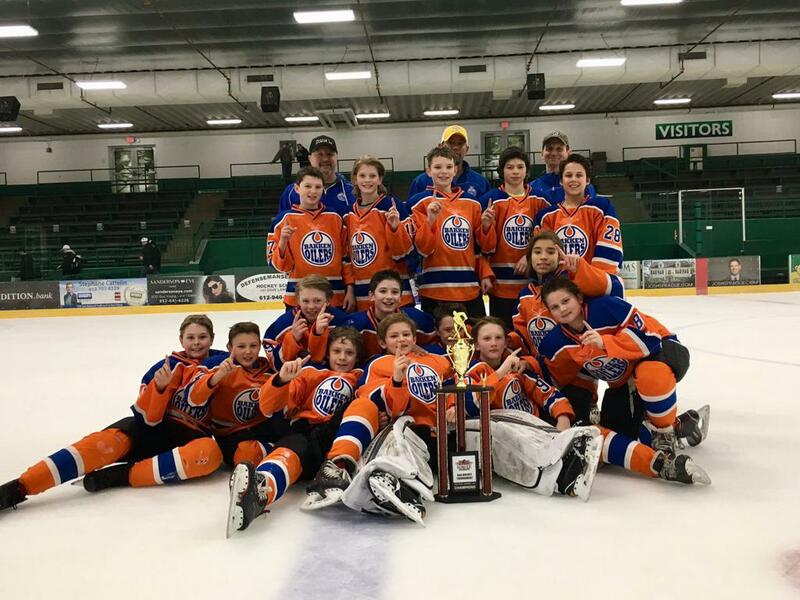 A shutout performance by Isak Bildsten propelled the Bakken Oilers to a 4-0 win over Euro American Blue in the finals of the 2006 Black Division, with three different players tallying goals in the win for the Oilers. Matthew Volkman led the way offensively with two goals and an assist, as Conrad Fondrk and Max Anderson chipped in one goal each for the Oilers. The Bakken Oilers, 2006 Black Division champions. A valiant comeback attempt by the Wisconsin Warriors fell just shot in the 2009 Black Division final, as Northern Elite's Luke Larson scored the game-winning goal midway through overtime to earn the championship. Larson finished as the game's leading scorer with his game-winner and two assists, while Jett Hoover and Easton Castle scored one goal each for Northern Elite. Scoring for the Wisconsin Warriors in the loss were Nicholas Hahn and Colin Black. Luke Larson (88) scores the game-winning goal in overtime for Northern Elite on Sunday afternoon. Tommy Chicago outlasted the Wolverines 6-1 on Sunday at Dakotah Ice Arena in Prior Lake to win the 2009 Red Bracket. The game featured the two top teams in the field who were both 4-0 on the weekend. In a high flying back and forth game, Tommy got up early and relied on great goaltending from Drew Sherman who sported a non-traditional number 7 on his back. Jackson Whalen had two goals and two assists to lead his team to the W.
The 2008 Red division featured the one and two seeds from the five team league, Tommy Chicago and MPH. These two teams were no strangers to one another, playing in pool play earlier in the morning with MPH winning 7-4. MPH got out fast (yes, pun intended) and put three goals up before Tommy Chicago could get their dough to rise. Axel Bisbee scored first for MPH and Luke Puchner followed and within the first few minutes MPH was flying. Lincoln Ayers-Asad and Puchner each had two goals in the win for MPH. A brief recap of five games played at Braemar Ice Arena, plus pictures.